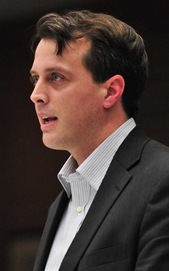 Posted on Tue, Jan 24, 2012 : 5:57 a.m.
Rich Sheridan, CEO of Ann Arbor-based software firm Menlo Innovations, told City Council members Monday night expanded transit will help him recruit talented employees. "I get around the country, and I see that the places that people who work for firms like mine are attracted to are places that have very strong transit systems," he said. "When I went to Portland, Oregon, I saw the ladies outside the airport terminal directing me to the downtown commuter rail system," he added. "I was a bit stunned by what they had there, and when I asked one of the citizens how was it that they approved that, they said, 'Oh, there was a big fight about this and we weren't sure anybody would use it.'" Rich Sheridan addresses the Ann Arbor City Council Monday night. But he said people were jam-packed "almost like sardines" in the system. Sheridan was among nearly 40 people who weighed in on the proposed countywide expansion of transit services during a two-hour public hearing before the City Council. The council took no final action at Monday's meeting but spent about an hour making a series of amendments to a four-party agreement that lays the framework for creating a new countywide transit agency replacing the Ann Arbor Transportation Authority. The council plans to resume discussions and possibly vote on the agreement at its Feb. 6 meeting. Most of the people who addressed council Monday night seemed generally supportive of expanding transit services throughout Washtenaw County. But while some were outright in favor of moving ahead with the four-party agreement, others expressed skepticism and urged the council to exercise caution given the magnitude of the decision. "The AATA and its consultants have spent a lot of time reaching out to the community to ask what kinds of services people want," said Ann Arbor resident Rita Mitchell. "I applaud their efforts for involvement of the community, but I'm concerned that at those meetings there may have been wonderful brainstorming sessions that ended up sounding like a promise of great services that may not be within the financial reach of the community." Ann Arbor resident Vivienne Armentrout asked council members whether it's fair that Ann Arbor residents are likely to shoulder most of the burden of taxation to support a new countywide authority. She also raised questions about the viability of an expanded system. Mayor John Hieftje said the city isn't rushing ahead with anything. He noted the talks of expanding transit services throughout the county have been around for years. "I don't think there's anybody on council who is in a hurry to get this done," he said. "I'm not against taking whatever time is needed to make sure that we get it right." Ann Arbor is being asked to enter into a four-party agreement with the AATA, Washtenaw County and Ypsilanti to initiate the process of morphing the city's transit agency — the AATA — into a new countywide authority under Michigan Public Act 196 of 1986. Council members stressed that even after approval of the four-party agreement, the council still could decide to opt out later, and residents will have a chance to vote on a funding proposal before any countywide transit authority becomes operational. The series of amendments made to the agreement Monday night are mostly an attempt to clarify the process, said Council Member Christopher Taylor, D-3rd Ward. "It has made more clear the opportunities for the city to pull back from the regional transportation plan if it chooses to do so in the future," he said. 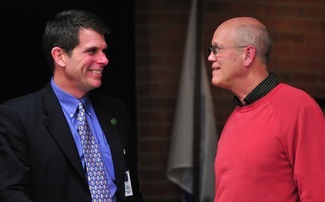 Ann Arbor City Administrator Steve Powers and Ypsilanti Mayor Paul Schreiber share a laugh during a break in Monday's meeting. One of the approved changes makes it so the Ann Arbor and Ypsilanti city councils will get a chance to vote on the articles of incorporation for the new authority. It also makes it clear that no transfer of assets to the new authority from AATA can occur unless a number of conditions stated in the agreement have been met first. "If the four-party agreement is approved, then the conversation is just beginning," Taylor said. "We'll get the fully fleshed-out funding plan from AATA, the fully fleshed-out service plan from AATA, we'll have an opportunity to review the incorporation articles, we'll have an opportunity to opt out of the authority in the statutory period, and we'll have the opportunity to decline to terminate the AATA agreement with the city." 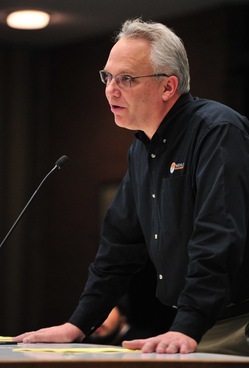 Ypsilanti Mayor Paul Schreiber was among those who addressed the City Council during Monday's public hearing. "I really appreciate AATA service to Ypsilanti and the residents of Ypsilanti appreciate it," he said. "As a matter of fact, they appreciate it so much they voted 3-to-1 to institute basically a 1-mill charter millage that would go toward transit service." 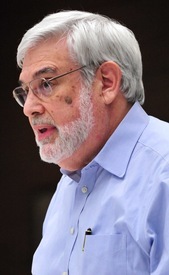 Schreiber said that 3-to-1 vote in November 2010 to pay for AATA services speaks volumes about how much the Ypsilanti community values public transit. "What this countywide plan does, it stabilizes our service," Schreiber said. AATA Chairman Jesse Bernstein noted 22 municipalities throughout the county are participating in the countywide expansion process. The implementation of the AATA's 30-year transit master plan will occur in five-year periods with specific goals and objectives, Bernstein said. "Funding must be in place as we decide which elements of the vision get implemented in the first five years," he said. "We asked leading finance experts from business, government, higher education and banking to look at the vision, the services we need to move forward toward this vision, and recommend the funding and service plan for the first five years." Bernstein said the funding comes from several sources, including the University of Michigan and Eastern Michigan University. "Their needs and the needs of businesses in general are an integral part of this plan," he said "The needs of the disadvantaged in the county are also part of the equation." York Township resident Bill Lavery introduced himself to council members as one of the members of the unincorporated countywide transit board, also known as the "u196 board." In preparation for creating a new countywide transit agency, Washtenaw County has been divided into eight districts represented by 15 delegates. The u196 board is expected to recommend bylaws and a service plan for the new system. Lavery represents the South Central District, which includes Milan, Saline and the townships of Lodi, York and Saline. "I circled through them today and they are supportive of the planning process that's under way and appreciate your work," he told council members. Ann Arbor school board member Simone Lightfoot encouraged council members to consider the opportunity to collaborate with Ann Arbor Public Schools on bus services. She said the district is expecting to cut about $15 million from its budget again this year, and that's bound to impact the ability to transport students. She said the district still is reeling from having to consolidate its transportation with the Washtenaw Intermediate School District. "I look forward to this particular effort moving forward so that we can sit and work with AATA to figure out how we can transport our children," she said. State Rep. Jeff Irwin, D-Ann Arbor, also spoke at Monday's public hearing and lobbied for expanded transit services. "We do have some holes in our service plan here in the city of Ann Arbor," he said, calling the current AATA services on nights and weekends "horrible." "If we do find a way to thread this needle and make all the interests happy and have countywide service, it's really going to serve to further cement Ann Arbor as the economic center of this region," Irwin said. Julie Steiner, executive director of the Washtenaw Housing Alliance, said the community cannot wait for expanded transit services. "We have people who cannot get to the jobs that are slowly starting to come back because they're not within the sphere of where our buses currently go," she said. "We have people who cannot get to child care. We have people who cannot pick up their children from school." Council Member Jane Lumm, an Independent who represents the 2nd Ward on council, tried unsuccessfully Monday night to amend the four-party agreement so that voter approval by Ann Arbor residents would be required before the city could pledge its full faith and credit for any projects taken on by the new countywide transit authority. 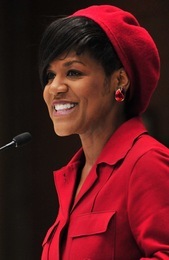 Only Council Member Stephen Kunselman, D-3rd Ward, supported her amendment, but he suggested it should apply only to capital projects costing $50 million or more. Other council members said they weren't sure why the city would make voter approval of individual projects a requirement when the city regularly pledges its full faith and credit for a wide range of capital projects, including utility system improvements. "We do that regularly because we want to keep the system moving and keep things being built on time and on schedule," Hieftje said. Lumm later lamented that her amendment "went down in flames." Tue, Jan 24, 2012 : 10:21 p.m.
enough people are out of work they will take the job they can get, if it comes with a bus pass or not. Ann Arbor is not a city on par with Portland or Chicago or another town with mass transit or huge bus systems. There isn't enough need for the expansion, there isn't the money to build it or sustain it once it is built. Tue, Jan 24, 2012 : 10:31 p.m.
patients who are coming to the hospital for more than usual and routine care usually have a family member with them. There may be a medical condition that is being addressed....the patient and family members would not choose a train over a family vehicle for these kinds of visits, i believe. For routine visits, the population served would be local and they would take their vehicle, like going to the Dentist or beauty shop. As far as &quot;going to Chicago&quot;-who are we talking about,exactly. People have less income and spur of the moment weekend trips in a state with an ailing economy/job and pay decline forgo these kinds of activities first. I just don't see the hip hip hooray&quot;let's go to Chicago&quot; phenomenon that people keep throwing up as the core argument for this project. Frankly, all of this mass transit talk from the City of Ann Arbor is very puzzling, as is this process. 1) Mass transit is regional. The logical region is metro Detroit. The population center is Detroit, with 700,000 citizens. It is a logical hub. Wayne, Oakland, Macomb, and Washtenaw Counties are the spokes. 2) Why are we not involved with all of these other parties in designing a true regional system? 3) Where is the greatest need in the region? 4) Where is the feasibility analysis that considers existing, and future problems and modal solutions, beneficiaries, and costs? 5) This is a time of vastly shrinking resources. For example, school districts are merging, or being asked to consolidate resources. Why isn't the City of Ann Arbor partnering with neighbors, and truly working on mass transit? 6) Mass transit is a state and federal issue. Federal funds are not currently available for rail. State funds are not currently available for rail, as evidenced in the recent cut of rail from the Woodward corridor. Why is the Ann Arbor city government of the mind that its small pool of taxpayers wishes to fund rail or expanded mass transit projects? Where is the cry? The answers to the last questions are vital. The City of Ann Arbor is running out of money. It is unable, or unwilling to perform basic services, such as public safety provision, and competent infrastructure repair, even though it collects taxes for these purposes. Also, AATA is in a deficit. Why? If AATA is not viable in its current form, why should we expand it? We should right size it, instead. This issue seems to be very much like that of our library lot &quot;conference center.&quot; A major, costly transit plan might already be in place. It seems that the citizens of Ann Arbor will be the last to know what the true plan is. By the way . . . I hear that Seattle has a very cool space needle . . . I am a strong supporter of the AATA, but we need to pin down the county wide funding before any more of AA's tax money is spent on planning. We all know that a county wide millage for mass transit would fail. Tue, Jan 24, 2012 : 6:09 p.m.
About 50% of the population of Washtenaw county lives in the Ann Arbor-Pittsfield-Ypsilanti corridor, which is already served by AATA. The rest is dispersed in dozens of low-density communities where a lot of investment in transit makes little sense. Ann Arbor already subsidizes Pittsfield and Ypsilanti bus service. This serves the town's interests since historically (and unfortunately, IMO) it has pushed the low wage workers who underpin its economy to those two communities. It would not serve A2's interests in any meaningful way that I can see to subsidize public transit in the rest of the county, which is both wealthier and much less dense than Pittsfield or Ypsi. WOW the mayor pulled out all the heavy muscle, AA school board, a state rep, the mayor of ypsi, trying to push this through. I think one of last statements sums up this councils views best and what people get so tired of. &quot;council members said they weren't sure why the city would make voter approval of individual projects a requirement when the city regularly pledges its full faith and credit for a wide range of capital projects, including utility system improvements.&quot; There is a difference between repairing and upgrading existing infrastructure vs. expanding infrastructure outside the city. The fact that council does not care about voter approval for extending services, not upgrading is the arrogance that drives us crazy. 750K for a water fountain I really wish the city would have asked. Incidently did the Mayor ever apologize for his disparaging remarks to Lumm? Tue, Jan 24, 2012 : 5:47 p.m.
All I can say is that in June of '08 I became quite worried about how much driving was costing me and I looked into less expensive ways to get around than driving my car. It does not take much to make transportation prices spike so in the long run it could turn out to be very useful in the future to have a well designed alternate way to get around. Tue, Jan 24, 2012 : 7:02 p.m. I use the bus every chance I get. But I only go to the grocery store about 1-2 times a month. I don't think they'd allow me to carry four bags of groceries onto the bus. I'm not sure I'd want to transport perishables on a bus without a cooler. So what's next? Online groceries with deliveries? More store closings then? Or do I have to go to the store every day or every other day. Yes, I take the bus whenever I can. Unfortunately, we can never really replace cars with buses. I wish I could come up with an environmentally safe and affordable fuel. &quot;When I went to Portland, Oregon, I saw the ladies outside the airport terminal directing me to the downtown commuter rail system,&quot; People who want to travel to and from the airport should not expect the rest of us to fund their business trips, or vacations. I like cheap travel to and from the airport like anyone else. But it is absurd to think that others should fund it - especially those who never go to the airport or use the system. That particular travel should not be subsidized. Quick google. I'm not an expert. This was just the first result that came up. <a href="http://www.businessrecord.com/main.asp?SectionID=39&SubSectionID=102&ArticleID=11714" rel='nofollow'>http://www.businessrecord.com/main.asp?SectionID=39&amp;SubSectionID=102&amp;ArticleID=11714</a> According to this year-old article: <a href="http://www.businessrecord.com/main.asp?SectionID=39&SubSectionID=102&ArticleID=11714" rel='nofollow'>http://www.businessrecord.com/main.asp?SectionID=39&amp;SubSectionID=102&amp;ArticleID=11714</a> &quot;U.S. highways, roads and streets have received more than $600 billion in subsidies over the last 63 years in excess of the amount raised through gasoline taxes.&quot; &quot;The report, "Do Roads Pay for Themselves?" concludes that gasoline taxes cover barely half the costs of building and maintaining roads, and can be expected to cover an increasingly smaller percentage over time. Tue, Jan 24, 2012 : 6:47 p.m. I don't see many elderly on the buses. It's hard to wait in the weather and it's hard to get up those steps! Tue, Jan 24, 2012 : 6:37 p.m.
Tue, Jan 24, 2012 : 6:05 p.m.
People who do not take transit still benefit from public transit. Less cars on the road means less wear-and-tear and, the long run, less need to expand road capacity. It also means less congestion for the rest of us. We all will get old. Any one of us might become disabled. A good public transit system acts as a safety net for all of us if/when we are unable to drive. My comments are mostly generic to any public transit, but they apply to travel to the airport as well. Many people have a relative (e.g. elderly parent) who is still capable of flying but not capable of driving. It's not just wealthy business people and wealthy vacationers. &quot;Then the same applies for roads.&quot; It's a different case. Feel free to make that argument in the right context, and I'll agree with you to a point. People who do not drive still benefit from the roads, so it is fair that they share some of that burden. Major differences: The airport is outside of our city and our county. People who don't go to the airport don't benefit from the shuttle. Then the same applies for roads. Tue, Jan 24, 2012 : 3:40 p.m.
&quot;Ann Arbor school board member Simone Lightfoot encouraged council members to consider the opportunity to collaborate with Ann Arbor Public Schools on bus services. &quot; This is what is needed. Better, more accommodating bus service right here in Ann Arbor. I like the idea of an expanded transit system. But, first, let's take care of some needs. Fri, Jan 27, 2012 : 6:52 a.m.
For middle school and up, it's extremely viable. Tue, Jan 24, 2012 : 6:23 p.m.
Tue, Jan 24, 2012 : 6:14 p.m. I don't know if i would want to put school kids on an AATA bus , i think school bus drivers have their hands full as it is you now want AATA drivers to chaperone under 18 kids?? really is that a viable plan?? Taxpayers also subsidize roads. Should we make them all self-funding toll roads? Tue, Jan 24, 2012 : 10:24 p.m.
We absolutely still need roads. However, that's an overly broad statement. We need lots of high maintenance, wide roads if we sprawl out and all use cars (except the disabled, elderly, teens, etc. who become second class citizens). If, however, we build dense communities, well interconnected by transit, with unspoiled rural land in between, we need less roads and the roads we do need can be smaller. Do we need the heavy hand of government to mandate the latter? Absolutely not. A reasonable investment in public transit motivates the free market to create dense transit corridors, reducing the overall need for roads. If you add up the total public cost of both models, I suspect the latter will result in a lower cost to the taxpayer and a higher quality of life. There are certainly plenty of studies which have investigated the trade-offs. There's no need to grow your own food, make your own clothes, or any other made up reasons not to have a rational economic discussion about the real costs and benefits. Tue, Jan 24, 2012 : 6:22 p.m. Unfortunately, we need roads. I'm not totally self sufficient. I can't grow all my food, make my own fabric to make my own clothes, etc. That's my point. All forms of transportation require funding. Some funding is direct (usage fees) and some is indirect (taxes). Some costs are captured (e.g. energy consumption) and some costs are not (e.g. the need to expand roads or pollution) Pious declarations holding some forms of transportation to one standard while ignoring facts about other forms of transportation are hypocritical. (And that's true for all points of view.) What we need are rational discussions about the real costs and benefits of various degrees of various forms of transportation to find the right mix for our area. Tue, Jan 24, 2012 : 3:49 p.m.
foobar, I would point out that the AATA buses also use those roads. Well, we know from population studies that when there are efficient roads leading in and out of cities, population follows the roads out, not in. I would argue that AA taxpayers should subsidize great transportation within AA -- both public transport and roads -- but that we should not subsidize the easy exodus of employees to live in sprawl around AA, whether those commuting lanes were roads or railroads. Tue, Jan 24, 2012 : 2:56 p.m. I am concerned that the big picture plan behind this seems detrimental to Ann Arbor's future. Why are we making it easier for people who work here to live elsewhere? Why do we want a sprawl? The ecologically valid approach is to concentrate people where the jobs and amenities are now. I agree with Sam Smith: instead of taxing Ann Arborites to pay for sprawl and thereby making it less likely people will want to live here, let's make Ann Arbor affordable, increase population here so that we can have the amenities we need without overburdening a shrinking population. Actually, if you read the Transit Master Plan, they make &quot;transit-oriented development&quot; a major benefit of the plan. This is new development along transit corridors. Maps and everything. Subsidizing commuting from other established communities is one thing. Promoting new development outside of current population centers is another. Of course the AATA officials see it differently! They need to justify more income and their jobs, avoid fixing the system (No night hours for evening/night shift workers; I saw two buses in less than a week that were disabled (one on Maple Rd, the other on Carpenter-Ellsworth), what to do for those people who miss a bus that's ahead of schedule, no shelters for people when the bus runs late, etc. Of course they see it differently! Do the AATA officials live in Ann Arbor? Do they take the bus or do they drive? If they live outside Ann Arbor are they going to take the bus into Ann Arbor? Tue, Jan 24, 2012 : 6:19 p.m.
Where is the concrete evidence this will prevent sprawl? Higher taxes means that more people will leave because they can't afford to pay them. Ann Arbor is so different than when I was growing up. I know of more people who used to live in Ann Arbor who now live in Ypsilanti, Dexter, Chelsea, Brighton, Howell, Milan,etc. Kind of sounds like Detroit but only the rich will be able to stay. Every time people ask me where I live and I tell them Ann Arbor they ask me, &quot;How can you afford to live there? What about the city taxes?&quot; So much for diversity. Tue, Jan 24, 2012 : 5:53 p.m.
Tue, Jan 24, 2012 : 1:50 p.m. I think what Rich Sheridan, CEO of Ann Arbor-based software firm Menlo Innovations is really saying is that with the type of wages and benefits Menlo pays, he requires Ann Arbor Taxpayers to pay for for his employees transportation costs. What's next, a taxpayer funded cafeteria? Tue, Jan 24, 2012 : 6:18 p.m.
Gosh, I wish you were right! Unfortunately, it is part of his business model. Go, check it out yourself if you don't believe me. Tue, Jan 24, 2012 : 3:50 p.m. The vast majority of his employees will be driving BMW's and Escalades not riding AATA buses! Wed, Jan 25, 2012 : 8:04 a.m.
Powdered Toastman, my point exactly! Students and staff all get to ride free using the M Card, And yea WE THE TAXPAYERS are paying twice to AATA. Think about it, our tax money goes to U-M and U-M pays to AATA! DUH! Tue, Jan 24, 2012 : 6:21 p.m.
kenUM: University of Michigan students pay tuition. In return for paying tuition they get to ride the UM buses (and city buses) for free. Duh! However, in this scenario, we, the taxpayers, get to fund the expansion of AATA which I refuse to pay for. Tue, Jan 24, 2012 : 5:31 p.m.
Tue, Jan 24, 2012 : 3:52 p.m. The &quot;kids&quot; who go to college here get to ride AATA for free, U-M pays for that! Tue, Jan 24, 2012 : 1:38 p.m.
the &quot;kids&quot; who go to college here are doing just fine-they are not concerned about bus rides to college. They pay high tuition rates and afford luxury rentals and many have autos-the&quot;kids&quot; here are not concerned about the AATA-in fact I would bet they rarely think about the AATA. Tue, Jan 24, 2012 : 12:49 p.m. If this passes where Ann Arbor shoulders the payment with increased taxes, more people, especially the dwindling middle class will leave Ann Arbor. Guess the students will pay for this and those people who left can then use the county transit to visit Ann Arbor if they want. But why would they visit unless they work here? Smart! More people would probably live in Ann Arbor if they could afford it. So let's continue the way we are going so that only the very rich and the students can live here. Then Ann Arbor can change its name to &quot;Deluded Elite&quot; while thumping its chest claiming to support diversity, the environment and other righteous causes as it crumbles into oblivion! Tue, Jan 24, 2012 : 12:37 p.m. The Mayor said: &quot;I don't think there's anybody on council who is in a hurry to get this done,&quot; he said. &quot;I'm not against taking whatever time is needed to make sure that we get it right.&quot; People usually don't deny something unless there's a grain of truth there. In fact, the Mayor tried to rush through the 4 party agreement at the previous council meeting. He sponsored the agenda item to approve it. The Mayor wants AATA's assets to use for his rail plans, for U of M's Fuller parking lot, and to subsidize development. The Mayor hopes no one is paying attention, and that he will be able to rush his plans through council. Tue, Jan 24, 2012 : 11:39 a.m. It should be noted, the Ecology Center/Recycle Ann Arbor (Mike Garfield has been a long time political supporter of the Mayor) sent out 'panic' emails and lobbied strongly for support of this initiative. I guess I would too if I received multi-year million dollar no bit contracts. Wouldn't want the people who supported my gravy train to have their transportation plan derailed. &quot; &quot;Council members stressed that even after approval of the four-party agreement, the council still could decide to opt out later...&quot;. The trademark of the Council Party and the Mayor: Jump in without having a clue, let things screw up and fix them later. No, this time, get it RIGHT the first time and allow Ann Arbor voters to vote moving into this up or down. Why is democracy such a dirty word to our Mayor? &quot;When I went to Portland, Oregon, I saw the ladies outside the airport terminal directing me to the downtown commuter rail system,&quot; he added. &quot;I was a bit stunned by what they had there. . . &quot; Rich Sheridan Portland's mass transit is certainly impressive: busses, light rail, streetcars, aerial trams . . . It's mass transit for a city population of 685,000, in a county of 735,000. The city to county population ratio is 93%, a unique situation. Portland's population growth has been over 1% a year, and is expected to continue for the next 50 years. Mass transit certainly becomes more viable for larger, growth-oriented populations. Contrast this dynamic to Ann Arbor's static population over the past 20 years, with little growth expected over the next 30 years. Therein lies the problem and challenge. What limited form of mass transit is appropriate for such a small, static population, in its midst of historic surrounding population loss? Tue, Jan 24, 2012 : 11:32 a.m.
&quot;Rich Sheridan, CEO of Ann Arbor-based software firm Menlo Innovations, told City Council members Monday night expanded transit will help him recruit talented employees.&quot; Sure it will. By having the taxpayers subsidize his employees' transportation expenses. No thanks, Rich -- pay for them yourself.